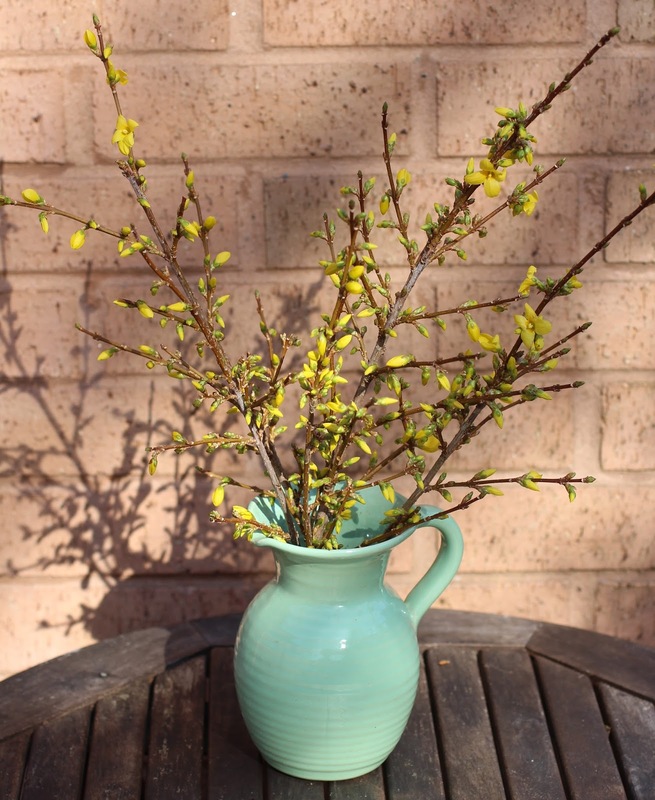 Just a sole occupant in today's 'In A Vase On Monday' - some branches from the forsythia that is just outside the allotment gates. I left it to late for forcing these into flower as early some of my blogging friends have done. Having said that though the shrub is still a way off being at its peak when it comes to blossom power. When I picked them after a Saturday afternoon stint at the allotment there was only a single flower open, but after almost a day in the relative warmth of our utility room there was a noticeable difference. There was also a marked difference in the weather when I took these photos late yesterday afternoon. We have sunshine, we have shadows, we have spring! It was interesting to go back in time to March 22nd 2009 when the forsythia last featured here in this post, describing my walk back home from the allotment. The forsythia was already in full blossom that day. Thanks as ever to our hostess Cathy over at the 'Rambling In The Garden' for her stalwart hosting. She has some exquisite spring treasures in her vase this week. I'm looking forward to checking in later to see what everyone else has in their vases this week. This week's 'In A Vase On Monday' was picked under a slight flurry of snow accompanied to the tune of a bone-chilling wind yesterday afternoon. It seemed as good as any time to get out there and snip a few hellebore flowers rather than wait until this morning and risk them being laid low by frost. It has just struck me that we will be officially into spring by next Monday so fingers crossed that the weather gods will oblige and deliver accordingly. I can only come up with one definite name for the hellebores in my vase and that's Helleborus 'Penny's Pink', who is floating in the top bottom hand corner. I love them all unconditionally but my favourites are the dark burgundy double and the single white. My vase is resting on a copy of 'The Cloud Spotter's Guide' by Gavin Pretor - Pinney, which makes for a fascinating read on the subject of clouds. My cloud vase is a much cherished gift, made some thirty years ago or so by a talented artist friend. Many thanks as always to our lovely and gracious hostess Cathy over at 'Rambling In The Garden' who is celebrating a special blogging milestone today. Many congratulations Cathy! P.S. The predicted frost for this morning didn't materialise but it's still very much on the cold side out there. Narcissus 'Tête-à-tête'. Although most of the narcissus I grow are either cream or white I am completely unable to resist these cheerful little bright yellow characters. A pulmonaria that has taken me by surprise. It's in danger of becoming smothered by ivy so that's another job for the list. I'm not sure which variety it is its origins being long lost in the mists of time. It has most plain foliage so could possibly be angustifolia. The snowdrop is 'Blonde Inge', which usually flowers in February here and has multiplied well. In the meantime today I feel that we are definitely now a step nearer to spring. Thanks to our excellent hostess Cathy over at 'Rambling In The Garden', who encouraged me to wrap up well and step out both yesterday in the extreme cold and again this afternoon to see what there might be to pick for a vase. "On colder days as a boy I would spend hours in the nursery daydreaming among the seed packets piled on top of each other, like an old-fashioned hanging at the Academy. Here the artists has painted the promise of a flaming June with a palette of scarlet and blues. I would pick up the packets and shake them : the seeds of the poppy produced barely a whisper, while the broad bean rattled like a maraca." ~ extract from 'Modern Nature' by Derek Jarman. 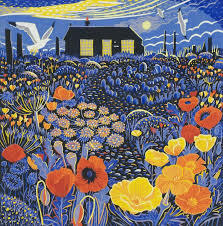 ~ Illustration by Annie Soudain.